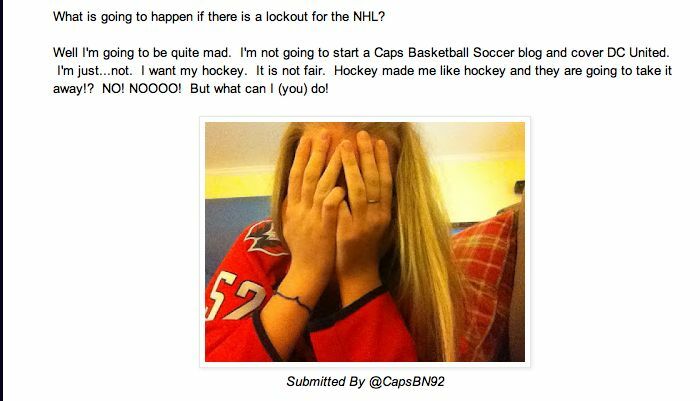 A few weeks ago, I asked Caps fans to send me some pictures of them being sad about the lockout. Well a few people actually sent in pictures, but not enough to create the video I envisioned. 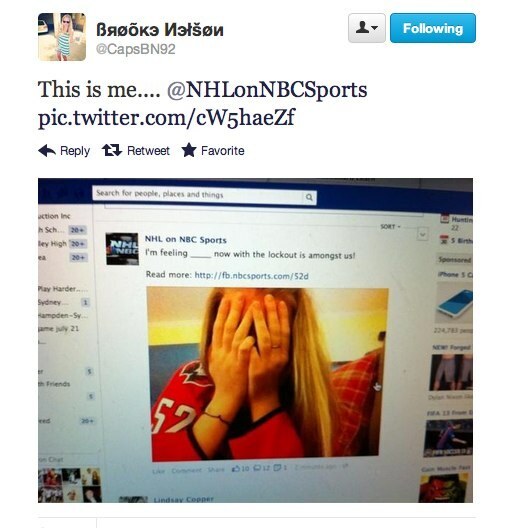 One of those people who sent me a photo was @CapsBN92 who emailed me (not tweeted, emailed) a picture of her with her face covered up because she was sad about the lockout. I posted it at the link above. Well today that picture, which was only posted on this website, and was never tweeted, showed up on the Facebook page of the NHL on NBC Sports. It didn't mention our site, and it didn't even mention the Twitter name of the person it was (which was posted below the pic on our site). UPDATE: NBC Sports finally amended the article, no link, just a credit below a link to their site.